Mary Saint, the rule-breaking, troubled former lead singer of the almost-famous band Sliced Ham, has pretty much given up on music after the trauma of her band member and lover Garbagio's death seven years earlier. Instead, with the help of her best friend, Thaddeus, she is trying to piece her life together while making mochaccinos in San Francisco. Meanwhile, back in her hometown of Swallow, New York, her mother, Jean Saint, struggles with her own ghosts. When Mary is invited to give a concert at her old high school, Jean is thrilled, though she's worried about what Father Benedict and her neighbors will think of songs such as "Sewer Flower" and "You're a Pig." But she soon realizes that there are going to be bigger problems when the whole town--including a discouraged teacher and a baker who's anything but sweet--gets in on the act. 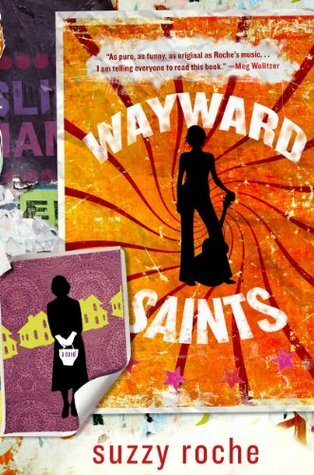 Filled with characters that are wild and original, yet still familiar and warm--plus plenty of great insider winks at the music industry--Wayward Saints is a touching and hilarious look at confronting your past and going home again. Mary Saint is the main character and very interesting. She is not your typical lead singer or musician. She marches to the beat of her own drum. The author provides the reader with details from Mary's past, including her touring and band experiences, as well as her current turmoil. What do you do after you are a lead singer? Mary still deals with the death of her boyfriend, Garbagio, and the disbanding of Sliced Ham (her former band). Mary's character was memorable and enjoyable. She seems so raw and real in the novel. Thaddeus, her best friend, is a compassionate character. The reader will be able to tell that he clearly cares for Mary and wants what is best for her. Jean, Mary's mother, comes off as a bit cold. She doesn't seem to have her daughter in mind most of the time and doesn't appear to care overly much for her. The other secondary characters were kind of just there, they didn't add much to the story. Mary's story is interesting and fun to read. If the reader enjoys musician stories, band stories, etc... this is a book that he/she will love. The author herself writes from a knowledgeable base, the reader can believe much of Mary's story. The book can be comical as well as serious. The events are well-written and flow perfectly. This novel is recommended to adult readers.